Managing, monitoring and reporting on growing distributed networks is increasingly complex and costly. Meanwhile, businesses must ensure uptime and meet strict regulations, within constrained budgets. Service providers must maintain service level agreements (SLAs) on more customer devices with more complex licensing, while meeting return on investment (ROI) targets. Without next-generation application traffic analytics and syslog reporting, organizations have no insight into bandwidth utilization, application traffic or employee productivity. Organizations need easy, affordable management tools that scale across thousands of appliances and security policies. The SonicWALL Global Management System (GMS) provides organizations, distributed enterprises and service providers with a powerful and intuitive solution to centrally manage and rapidly deploy SonicWALL firewall, anti-spam, backup and recovery and secure remote access solutions. GMS provides centralized, real-time monitoring and comprehensive policy and compliance reporting. For enterprise customers, GMS streamlines security policy management and appliance deployment, minimizing administration overhead. For Service Providers, GMS simplifies the security management of multiple clients and creates additional revenue opportunities. Administrators can cluster GMS solutions for added redundancy and scalability. Flexible deployment options include software, hardware and a virtual appliance. Centralized security and network management - Helps administrators deploy, manage and monitor a distributed network environment. Simple policy configuration - Easily set policies for thousands of SonicWALL firewall, anti-spam, backup and recovery, and secure remote access devices from a central location. Sophisticated VPN deployment and configuration - Simplify the enablement of VPN connectivity and consolidate thousands of security policies. Offline management - Enables scheduling of configurations and firmware updates on managed appliances to minimize service disruptions. Streamlined license management - Simplifies appliance management via a unified console, and the management of security and support license subscriptions. 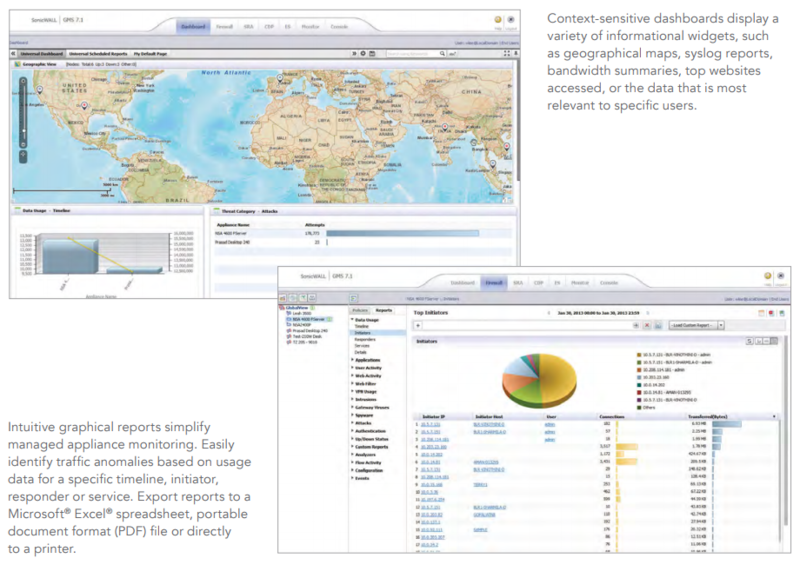 Universal dashboard - Features customizable widgets, geographic maps and user-centric reporting. Active-device monitoring and alerting - Provides real-time alerts with integrated monitoring capabilities and facilitates troubleshooting efforts, allowing administrators to take preventative action and deliver immediate remediation. SNMP support - Provides powerful, real-time traps for all Transmission Control Protocol/Internet Protocol (TCP/ IP) and SNMP-enabled devices and applications, greatly enhancing troubleshooting efforts to pinpoint and respond to critical network events. 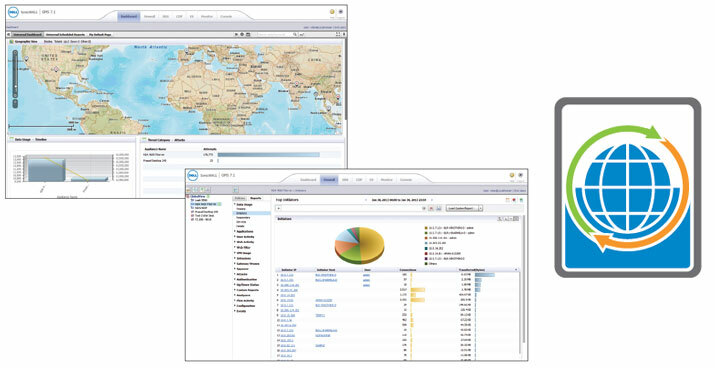 Intelligent reporting and activity visualization - Provides comprehensive management and graphical reports for SonicWALL firewall, anti-spam, backup and recovery and secure remote access devices. Enables greater insight into usage trends and security events while delivering a cohesive branding for service providers. Centralized logging - Offers a central location for consolidating security events and logs for thousands of appliances, providing a single point to conduct network forensics. Real-time and historic next-generation syslog reporting - Through a revolutionary enhancement in architecture, streamlines the timeconsuming summarization process, allowing for near real-time reporting on incoming syslog messages. Also provides provides the ability to drill down into data and customize reports extensively. Application traffic analytics - Provide organizations with powerful insight into application traffic, bandwidth utilization and security threats while providing powerful troubleshooting and forensics capabilities. Real-time and historic data flow reporting - Offers administrators an effective and efficient interface to visually monitor their network in real-time, providing the ability to identify applications and websites with high bandwidth demands, view application usage per user and anticipate attacks and threats encountered by the network. Extensive cross-platform support - Provides coverage for all SonicWALL products on the network. Flexible deployment options - Optimize utilization, ease migration and reduce capital costs. Rich integration options - Provide application programming interface (API) for web services, command line interface (CLI) support for the majority of functions and SNMP trap support for both service providers and enterprises. GMS provides a comprehensive security management solution for enterprises and service providers. x86 Environment: Minimum 3 GHz processor server dual-core CPU Intel processor, 8 GB RAM (4 GB minimum) and 300 GB disk space. GMS Server: x86 Environment: Minimum 3 GHz processor Server dual-core CPU Intel processor, 8 GB RAM (4 GB minimum) and 300 GB disk space. GMS 7.2 supports IPv6 management and configuration of firewalls, Domain Name System (DNS) and Neighbor Discovery Protocol (NDP). 1 In all instances, SonicWALL GMS is running as a 32-bit application. Bundled databases will run in 64-bit mode on 64-bit Windows OS. In Virtual Appliance, GMS is running in 64-bit mode. 2 Legacy SonicWALL XPRS/XPRS2, SonicWALL SOHO2, SonicWALL Tele2 and SonicWALL Pro/ Pro-VX models are not supported. 3 Only newer Aventail E-Class SSL VPN appliances using 12 character hexidecimal serial numbers. Support is required at ALL TIMES for GMS Licensing. Customers looking to renew expired Support Contracts will be back-dated when the Contract is renewed to the previous expiration date. There are no exceptions to this rule. *E-Class support sold separately, E-Class support required purchase with GMS. Includes 24x7 telephone, email and Web-based Support, Software updates, access to electronic Support tools and moderated discussion groups. Support only applies to GMS Software, not to The managed appliances. If GMS is deployed on one or more UMA EM5000 devices, The UMA EM5000 devices are also covered under The Support contract. Hardware maintenance For UMA EM5000 devices is sold separately. Includes 24x7 telephone, email and Web-based Support, Software and firmware updates, Advance Exchange hardware replacement For devices under management (excluding E-Class appliances), access to electronic Support tools and moderated discussion groups. Support is For both GMS Software and The managed appliances, excluding E-Class appliances. If GMS is deployed on one or more UMA EM5000 devices, The UMA EM5000 devices are also covered under The Support contract. Hardware maintenance For UMA EM5000 devices is sold separately.